Welcome to Tip Tuesday Linkup Party #5! Helping others is something that I like to do. I am a firm believer that knowledge, of any kind, must be shared. And that is the idea behind the Tip Tuesday Linkup Party. Know an easier version of some recipe? Got some social media skills that will help others? Learned about a new workout technique? Found a hack that simplifies life? Discovered a different parenting tip? Starting this week, we will be featuring the most clicked link from the previous week. I would like to invite everyone to stop by Terri’s post if you have not done it yet. Top 3 Tip Tuesday #4: Kath, Shellie and Wendy. My most deepest thank you to everyone who participated and is helping our link party grow! Want to be featured too? Would you like to be part of our top 3? Then join us every week on Tip Tuesday and boost your post! 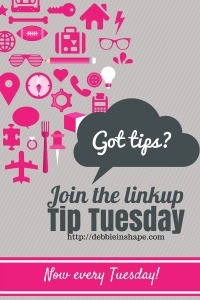 Every Tuesday, we are hosting a Tip Tuesday Linkup Party. There are no prompts, so feel free to share not only about training and dieting, but any tips you consider relevant or helpful to others. Do you have any questions? Did I miss something important? Please leave me your feedback. Follow Debbie in Shape [DiS]’s board Tip Tuesday Link Party on Pinterest. Disclaimer: The ideas, experiences and suggestions shared are the author’s own. Debbie In Shape and the host(s) of the linkup does(do) not own or is(are) not responsible for the contents of the participant blogs. No advice should be taken that go against your beliefs, practices or medical condition.